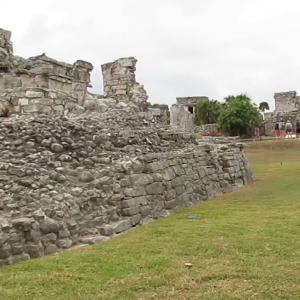 Tulum is a wonderful city that has access to a variety of ancient sites within driving distance. We have created a tour that allows you to see three of the most popular destinations in one tour. We start with a Tulum tour from Tulum where you will get to see the ancient ruins of Tulum and then we move on to a Coba tour from Tulum and finish it off with a swim in the Gran Cenote. Our Tulum tour from Tulum is one of our most popular destination. The area is one of the youngest Mayan cities and as such is relatively intact. When you arrive you are greeted right away by a unique sight and the further that you get into the Tulum ruins the more there is to see. While you can no longer climb the pyramid steps at Tulum, you can walk around the giant work of art that towers above the water. The views of turquoise Caribbean sea water are very picturesque. Because of the quality of the Tulum ruins it is the third most popular Mayan ruins to visit. It is our most popular visit because people want to see the most intact ruins in the area. 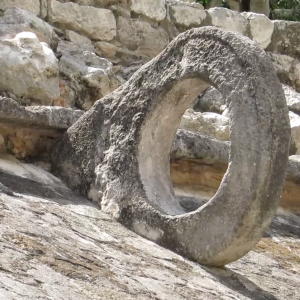 The Coba ruins are another point of interest in the Yucatan Peninsula. Archaeologists believe that Coba was a much different style of city than many other Mayan cities. Multiple different types of settlements were located in one place and that includes houses, religious buildings, trade buildings, and more. It is also bordered by two lagoons. 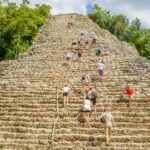 One of the reasons that the Coba ruins are so popular is the fact that they have one of the last pyramids from the Mayans that you are allowed to climb. Our Coba tour ensures that you have time to climb to the top of the pyramid and take a look over the vast land that makes up the Yukatan. From the top you will notice several hills of vegetation, these are parymids and other structures that have yet to be excavated. There are also several houses and other pieces of architecture for you to explore while you are in the area. 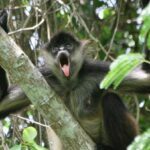 With this tour you should have plenty of time to explore these locations. 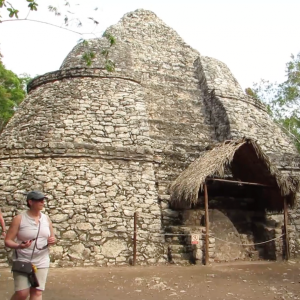 Our Coba tours are our second most popular tour. 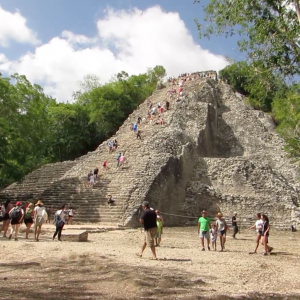 People love to see Coba because of the environment around it and the fact that you can climb the pyramid. A cenote is a giant religious well that have become popular locations to swim and snorkel. The water is very pure and appears to be a very clear brilliant blue color. There is plenty to explore in the water even after the Coba tour and Tulum tour. 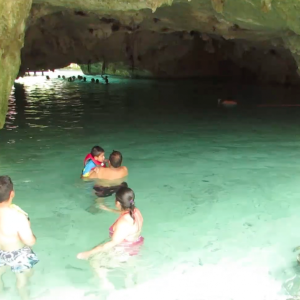 The Gran Cenote gives you a chance to swim in some of the best cavern swimming locations you have ever seen. A lot of our guests who don’t have experience snorkeling opt to just explore the water while swimming or float in the healing pool. For those with experience snorkeling there are caves and underwater tunnels to explore. The stalactites and fish are wonderful to take a look at. There are very few places that you can swim that are this wild, natural and untouched. 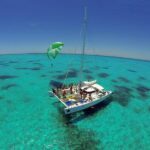 Snorkeling allows you to reach even more unique areas which is why many opt to try it. 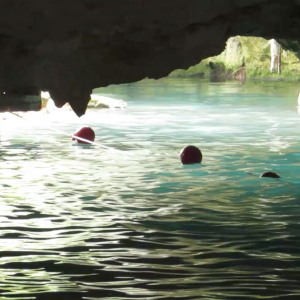 Despite being a semi-religious site, it is completely acceptable to swim in the Gran Cenote. In fact, it is considered good due to the fact the well is supposed to be healing and to help with any ailments you might be suffering from. Our Tulum Tour from Tulum and our Coba Tour from Tulum include transportation in an air-conditioned vehicle along with entrance to the sites that we visit. 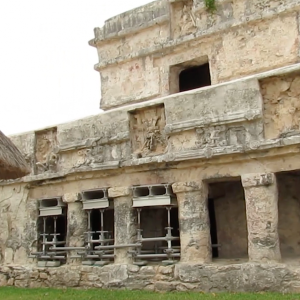 Our Coba tours from Tulum also include free time at the ruins for you to explore on your own. While a tour guide can give you the history and facts, chances are you will want to also experience the Coba ruins on your own. The three-part tour for Tulum, Coba, and the Gran Cenote also includes a lunch buffet that you will get the chance to sit and enjoy with your guide and fellow tour mates. We look forward to being able to show you around some of the biggest historical sites in Mexico. Don’t forget to bring your swimwear and sunscreen because the tour would not be fun without it! Hotel pick up approximately 7:00 – 7:30 a.m., Tour returns between 8:00 – 8:30 p.m.